Our final day of Think Camp was fun filled and busy as can be! We had so much going on-with students sharing projects in every single class and Bloxels coming in to share their new app with us. The Bloxels team was excited to show us their new Bloxels EDU app. Our campers tested out their app and were able to give them valuable feedback as well. It was a joy to see our campers beam with pride as they shared their projects with each other today. The bits group are becoming experts at Scratch. Today most of the campers were busy adding the finishing touches to their games that we shared at the end of our session. The exciting part of today was to watch students that just met help one another fix bugs in their code. It was impressive to see the collaboration between students so young. The Creative Coders all have their own login credentials to access their Scratch projects at home. Have your child show you all of their hard work. Many campers still have more ideas they'd like to add to their games. If you would like to view the projects of the other campers you can do so here. The campers finished their projects with littleBits. Their goal was to “make something that does something.” The creations wowed everyone. We had a lot of cool inventions! View the littleBits inventions from this week. Today’s Bloxels class was a lot of fun. The bits group spent the first half of class putting finishing touches on their games. They made sure everything was decorated and configured correctly, so the player would have the best experience playing their game. Then we shared our games on the public Infinity Wall, where all Bloxels game designers post their work. We spent most of the second half of our class playing each others’ games. Everyone had a finished game to share, and they enjoyed having their fellow designers play their games. 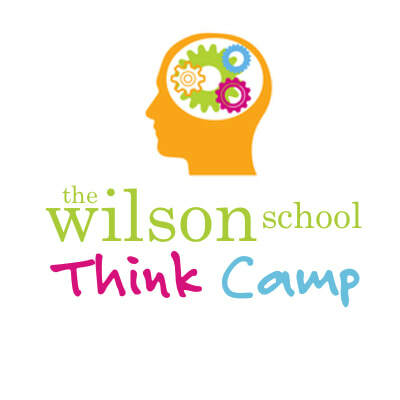 We want to thank you all for choosing to send your children to Think Camp at The Wilson School. The campers explored, experimented, and collaborated as only Think Campers could. It was a wonderful week! Today’s video sparked a lot of conversation. We watched this video about a new kind of six pack ring for beverages. The campers were impressed by the simplicity of this change to six pack rings and how it could really help the environment and animals. They were asked, What could you redesign to help animals?. They had so many good ideas, mostly focusing on lessening the plastic in our waterways and creating things that easily biodegrade. One camper wanted to create balloons that biodegrade easily and sort of disintegrate so animals wouldn’t get stuck in them. Another wanted to add robotic arms to boats that would reach out and grab garbage from the water. Our future is bright if these campers have anything to say about it. Today’s STEM Challenge was the Pristine Trampoline. Campers were given a colander and a collection of supplies (rubber bands, binder clips, toothpicks, and collections of material and fabric). Using these supplies, they worked as a group to create a trampoline. Each group took turns trying to see whose trampoline would cause a golf ball to bounce up the highest. The Bits have begun some very creative games using Scratch and I can't wait to play them myself, especially the one about the chicken and the egg, and the unicorn leprechaun game . The campers had to spend some time thinking about the instructions they would like to provide their players. Creative Coders are realizing that Scratch teaches much more than computer programming. Scratch is teaching them to solve their own problems, and discover how to work things out for themselves. Campers put the final touches on their designs today. They are getting ready to present their new creations to the group tomorrow. We will share the photos with you of finished projects. To give you a sense of what we have accomplished, some of the projects you will see are a pinball machine, a carousel, many confetti blowers, a DJ in a box, a scrolling sign, flashlights, and startle boxes. We watched an amazing video from The Boring Company today. The Boring Company proposes to build a network of underground tunnels to reduce traffic. The travel would be faster and more efficient than the roads and highways we have today. The campers were asked, Do you think the boring tunnels will work? What would you change? As usual, the campers had all kinds of wonderful ideas on this topic. Most thought it would work, but worried about tunnel collapse, earthquakes, damage to the surfaces above, and more. The campers even wondered if this underground system of travel would lead to underground cities and homes being developed. These kids are great thinkers! We also talked about how we can learn so much from our failures. The campers were amazed to learn how many hundreds of times J.K. Rowling and Walt Disney were turned down before creating their famous empires we know and love today. Today’s STEM Challenge was the Army Parachute. Using the materials supplied, campers designed and built a parachute that allowed Kevin the ‘army man’ to land safely on his feet. Students that could design a working parachute from the greatest height won this challenge. There were several successful and safe landings from a 20 foot drop! Both groups of students continued to refine their designs today. They had to problem solve and work with the littleBits to get to their desired outcome. They have great ideas and showed a lot of grit as they design, redesign, and redesign some more. Campers have been working hard to get conveyor belts, confetti cannons, pulleys, and even Arduino coding to work in order to push their creations. The bits continued to work on adding a story element to their game. They needed to develop a final objective or end boss for their game. By the end of the class today, everyone had two fully decorated and configured rooms and at least one story block. The story block gives the opportunity to provide directions to the player and tell the story as the player moves through the game. Today in the bits group, both groups started to really focus on their challenge. The red team created Bugs Bunny, SpongeBob and Patrick characters as their rollercoaster moves towards the ocean in their theme park! The blue team started working on a Star Wars theme with Chewbacca, Yoda and a Storm Trooper completed so far. Today’s inspirational video was all about making life easier. We watched as the FoldiMate device folded laundry perfectly and very quickly. We were all amazed and agreed we want it. We talked a bit about how designing something that makes life easier for people is often very popular and successful. The campers were asked, What would you invent to make a chore easier? The campers had so many good ideas! We had everything from a drone that would make your bed each morning, to a bot that picks up dog poop, to a device that can pack your bags for trips. The campers were so excited to share their ideas with each other. Today we introduced the Breakout EDU games. It takes an immense amount of problem solving and critical thinking within the group to break out. The bits group worked hard to get out of the Number Ninjas, but the first group did not make it today. They got caught up on the last crucial clue. We wish them better luck tomorrow. The bytes group worked hard to get Back to Reality and made it out! Both groups worked very hard and should be proud of their efforts. Today’s STEM Challenge was the Space Lander Challenge. Using the materials supplied, campers designed and built a shock-absorbing lander to protect two aliens during impact on Earth. The aliens were represented by two marshmallows in an upright cup. Keeping the “aliens” in the cup proved to be a real challenge, but three groups succeeded with their mission. The campers had a recap of the functions of littleBits by playing a Kahoot! quiz. Campers were introduced to the “Engineering Process” where they defined a problem, imagined different solutions for that problem, made a plan through sketches with labels, created a prototype to test their design, and adjusted their design by making improvements. Many quickly discovered that this is not a linear process, but one that continues until they develop something that solves the defined problem. They began designing their project that simply "does something." It was wonderful seeing the brainstorming happening by the campers and the redesign process taking place as they created their self-directed projects. So far, we are seeing a DJ dance party in a box, a scary startle spider to keep siblings out of a room, a scrolling sign, a dancing man, a pinball machine, and advanced coding of littleBits using Arduino. The Bits began thinking of a story to tell with their game. They thought of other games that tell a story as the main character moves through the levels/rooms. Then, they had some think time to develop their own story to tell through the creation of their Bloxels game. They learned how to use story blocks and checkpoints as a way to tell the story and give the player directions and objectives. We will continue developing this tomorrow. Towards the end of our session today, the group learned how to decorate their game to make it look like a real game and to add challenges for the player. They learned the difference between animations and boards when decorating and thought about how to effectively tie rooms together. Tomorrow we will continue to develop our stories and we will think backwards from the final objectives. Today in the bits group, they were much more efficient than yesterday and started thinking as a team rather than as an individual. The red team have created Mickey Mouse, Minnie Mouse, Donald Duck & Daisy Duck characters in their theme park! The blue team are working on adding planets and moons to their space theme park! This second day of Think Camp was wonderful. We watched as the campers gained confidence and familiarity with each other to complete tasks. It is great to see them collaborating and sharing ideas freely with each other. We can’t wait to see what they accomplish by the end of the week. To kick off Think Camp, each camper was presented with their very own Idea Book to collect all their wonderful ideas throughout the week. They all agreed that sometimes if you don’t write or sketch your idea it’s gone forever. Each day we will show the campers a video that we find inspiring. Today we watched New Doors. Have you ever stopped to think about how everyday items came to be and whether or not they need any changing? Each video is accompanied by a question and answered however they like in their Idea Books. Today’s question was, What part of a home would you redesign? The campers had some wonderful ideas, like windows with built-in binoculars in the glass and shutters that protect your home from harm. Code-a-Robot with Sphero, Dash & Dot: Three different robots that inspire a love of robotics, coding, and STEM principles... all through play. Brain Games with Breakout EDU: Similar to an escape room game, “breakouts” teach teamwork, problem solving, critical thinking, and troubleshooting by presenting participants with challenges that ignite their natural drive to problem-solve. We have two Breakout Challenges this week. For the bits we have “Number Ninjas.” For the bytes, we have “Back to Reality (Minecraft Theme).” In both games, campers must figure out ways to unlock the central box that contains numerous locks. There are clues hidden all over the room that need to be pieced together. Some are in plain sight, and others are less obvious. This center will begin tomorrow. Today’s STEM Challenge was the Paper Chair Engineering Challenge. Campers first chose a stuffed animal. They varied in shape, size, and weight. Next, they were given the challenge to build a chair to support their chosen stuffed animal out of only paper and masking tape. The chair created had to be freestanding and constructed on a flat surface. Campers learned a lot and found successes from many different approaches. Many learned that folding or rolling the paper made it much stronger and were amazed at what they could accomplish with so few materials. The bits group used Scratch Jr. to explore some basic coding concepts. We learned that the sequence of the code really matters. The children put together code that allowed a car to drive across the screen, made characters dance until they disappear, and created an animal race. Tomorrow the campers will be ready to begin planning a game or animation. The campers were introduced to littleBits Electronics. In case you are curious, you can watch the What is littleBits? video to see what it is all about. The campers were engaged in design challenges that made them think through how inputs and outputs work together to create different functioning circuits. They also had free experimentation with the littleBits to deepen understanding of what they can do. Through this, campers learned that order matters in a circuit and that each bit has a function. Starting with a battery, wire, and power bit, the campers then found countless number of combinations to make things light up, move, and produce sound. Once they understood the basics of what the bits can do, they were challenged to make something that does something. Some ideas that came up in brainstorming included a robot designed to keep siblings out of a room, a robot dance machine, a confetti cannon, and even a pinball machine. We will see where their creativity and knowledge take them! The bits group learned many of the possibilities of Bloxels Game Design. They had the opportunity to try out a pre-built game called “Poultry Panic.” In playing this game, they began to understand what they could do with Bloxels. After trying out this pre-existing game with a stock character, they had the opportunity to design, build, and animate their own character. They made decisions about their character’s appearance when idle, walking, and jumping. They manipulated frame rate and examined how it changed their character’s animation. They tested their character in the pre-built test room to see how it looked in action. At the end of our session, we introduced the idea of building the first room of our game. Students learned how to put their own character into the first room of their game. Tomorrow, we will dive deeper into our game design, explore tying rooms together, and develop an overall story. The bits group was introduced to the “Roller Coaster Theme Park” challenge on Minecraft Education Edition. They were divided into two teams - red & blue to make the most creative and exciting theme park. The students brainstormed ideas of what they would like the “themes” to be. Red team are working on a “Cartoon” themed park and blue team are working on a “Space” themed park. The teams have also been assigned a 6th grade intern who is helping them. The students have been asked to wear their team colors this week and have learned that there is still lots more to learn about Minecraft! They are gradually realizing that if they stop and think first, it makes life a lot easier. By the end of the session they started to work together as a team. We had a wonderful first day of Think Camp! We had lots of kids investigating many intriguing questions. We heard squeals of joy as the campers opened up a CPU to see what inside for the first time and an amazing amount of collaboration was happening. We can’t wait for tomorrow!